Charles Dodgson was a 19th century mathematician who was interested the following geometric paradox involving an 8x8 grid. Consider a regular 8x8 grid as shown on the left. Since each unit cell has an area of 1, the total area of the square is 8x8 = 64. Slicing the grid along the dark lines leaves us with 2 triangles and 2 trapezoids. If we rearrange these pieces as shown on the right, we construct a rectangle of length 13 and breadth 5, resulting in a total area of 13x5 = 65. I encourage you to try this with real paper, it is quite impressive. The puzzle remains however: did we just create an extra square? If each grid was a chocolate bar, we have essentially created chocolate!!!! And in this discrepancy lies the answer to our quest. The two sides form a kink in the diagonal. There exists a smaaaaaaalllll gap between the diagonals of the rectangle in the shape of a stretched out parallelogram of unit area. Although this puzzle was not invented by Charles Dodgson, it was a favorite of his. His most recognized work on 8x8 grids, however, comes from the sphere of literature in Through the Looking Glass, for Charles Dodgson pseudonymously was Lewis Carroll. I recently finished reading Alice's Adventures in Wonderland and it is now one of my favorite books of all time. Despite Alice being presented as a fictional tale for children, there is no denying that the novel contains some of the best in absurdist comedy and play on logic; it is the confluence of Lewis Carroll the writer and Charles Dodgson the mathematician. A dominant theme in the story is the questioning of rules - Alice soon realizes that the rules of Wonderland are quite unlike the rules of the real world she was raised in and she interacts with the inhabitant characters and objects in Wonderland to figure out a system, a pattern, to navigate her way back home. Each encounter she makes leads to an unpredictable outcome that Alice is at one point disappointed when nothing extraordinary occurs. To understand the significance of rules in Alice, it is helpful to take into context the time in which the novel was written. Alice's Adventures in Wonderland was published in 1865, amidst strict rule-based Victorian societal conventions and a period of change in scientific knowledge. Some say that the nonsensical aspect in the book is Charles Dodgson's satirical remark on the oppositions to Euclidean mathematics that were springing up. Prior to this era, Euclidean geometry was the only available geometrical method and all prevailing science was based on Euclidean models. It was built on a set of 5 inviolable axioms, which formed the basis of all mathematical theories and formulas. In the later half of the 19th century - about the time Charles was pursuing his education in Christ Church, University of Oxford - many mathematicians began to contest the validity of the Euclidean axioms, and through this opposition came about the new field of non-Euclidean geometry. Charles was an ardent believer of the Euclidean system and hence it may appear that many of the passages in Alice are an indirect dig at the rising popularity of non-Euclidean geometry and the making up of new rules. ’I’m not a mile high,’ said Alice. ’You are,’ said the King. ’Nearly two miles high,’ added the Queen. This seemingly innocent dialogue on second glance(and a quick Internet search) is actually amazing. 42 breaks the system. It is not confirmed if Lewis Carroll had intended this, but I'd like to think that he did. Even if he did not, that is one neat coincidence! Another thesis on the scientific commentary present in Alice's Adventures in Wonderland pertains to the Darwin's Theory of Evolution. Charles Darwin's On the Origin of Species was published in 1859, merely 5 years before the release of Alice. At the time it was published, it generated widespread attention and prompted a paradigm shift in the understanding of design of the natural world. Darwin theorized that all living species descended over time from common ancestors and assumed their current state through successive stages of evolution and natural selection. It can be claimed that the whimsy of the characters in Wonderland deals with the shifting notions of evolutionary thought and adaptation, just as Alice adapts to the strange rules of the new world she has entered. Suppose a newly-born pair of rabbits, one male, one female, are put in a field. New-born rabbits take one month to grow into adults following which they mate such that at the end of its second month, an adult female can produce another pair of rabbits. Assuming that our rabbits live forever and that the adult female always produces one new pair (one male, one female) after one month of gestation, how many rabbit pairs will be there at the end of the year? Every level depicts one month. A blue arrow represents reproduction and an orange arrow stands for growth. I had to limit to 6 months because the arrows were getting out of hand and everyone knows that's the universal indicator for the time to stop. 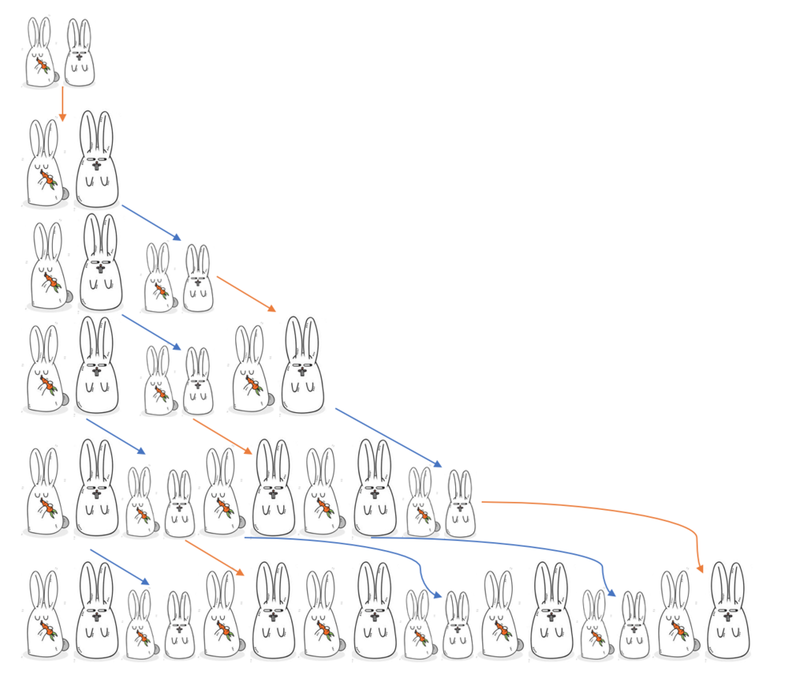 This is indeed the Fibonacci sequence and the classic rabbit problem described by Leonardo Bonacci in his seminal work, Liber Abaci. The Fibonacci sequence also interestingly ties into the area paradox problem we had discussed at the beginning of this article. Fibonacci numbers hold the curious property that in a sequence of 3 consecutive Fibonacci numbers, the square of the middle number is 1 less than the product of the outer numbers (except 1, 2, 3; here it is 1 greater). Hence the area paradox grid can be constructed by dividing a square grid of side length equal to any middle Fibonacci number and rearranging it into a rectangle of sides equal to the outer numbers. Since in our example only 1/64th of the total area is missing, it is easy to overlook the trick. The same experiment demonstrated on a 3x3 grid more readily reveals the catch.